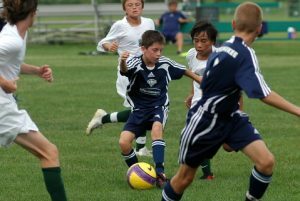 Metropolitan Milwaukee boasts a rich history of youth, amateur, and semiprofessional soccer programs. It can even lay claim to holding the first recorded match in the United States, a challenge between Carroll College students and Waukesha youths in 1866. By the early twentieth century, clubs in the city of Milwaukee formed among immigrants in ethnic neighborhoods. Two such clubs, the Croatian Eagles, the oldest club still in existence in North America (founded 1922) and the Milwaukee Bavarians (founded 1929), remain active to this day. Both have experienced success. The Bavarians have won six United States Amateur Soccer Association (USASA) Amateur Cup or Open Cup titles between 1976 and 2009, and the Eagles won the USASA Open Cup in 2012. And both have developed substantial women’s and youth teams. On the professional level, the Milwaukee Wave of the Major Arena Soccer League (formerly Major Indoor Soccer League) has been a staple in the city since 1984, winning various league titles on six occasions. The Milwaukee Rampage played from 1994-2002 in the A-League, then the 2nd division of American soccer. During their nine seasons, they were league champions twice. In 2003 the Milwaukee Wave assumed ownership of the Rampage and rebranded them as Milwaukee Wave United. The Wave’s outdoor adventure lasted only two seasons before they went back to focusing on the indoor game, leaving Milwaukee without an outdoor professional team. Clubs like the Bavarians and the Eagles had vibrant youth programs, boasting boys and girls teams from U-9 (under age nine) division teams to U-18 division teams at various skill levels. Other clubs also worked to develop young players. The Milwaukee Kickers program was launched in 1968 with just five teams; in 2015 it boasted 650 teams across 60 leagues spread throughout Southeastern Wisconsin. Private club sides such as the old FC Milwaukee, now FC Wisconsin, developed youth talent through tournament play across the country. 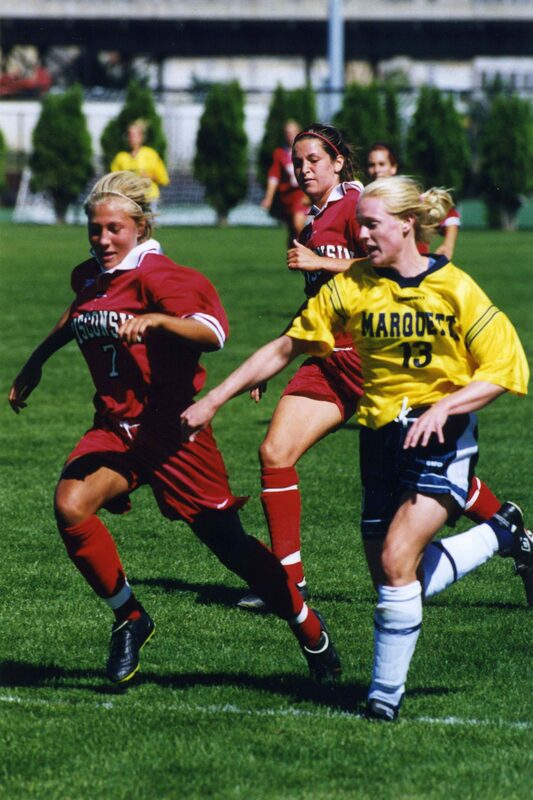 In addition to the club soccer presence, Milwaukee has two Division I college soccer programs. The University of Wisconsin-Milwaukee men’s soccer program began in 1973 and by 2015 had amassed a record of 450 wins, 298 draws, and 75 losses, while winning five regular season conference titles and appearing in the NCAA Tournament nine times. A women’s team followed in 1984, and by 2015 boasted an all-time record of 310-205-54, while winning 15 regular season conference titles and making 11 tournament appearances. Marquette University’s MU) men’s program, which began in 1964, has an all-time record of 387-364-86 and has appeared three times in the NCAA tournament. MU did not begin a women’s program until 1993, but by 2015 the women had amassed a record of 303-131-46 and had played in 12 NCAA tournaments. ^ Eric Anderson, “Waukesha: Birthplace of U.S. Soccer?” accessed on August 24, 2015; Tom McCabe, “The Pioneer of Paterson: A Founding Father of American Soccer Needs Rescuing from the Ash Heap,” Howler Magazine 6, accessed July 28, 2016. ^ Croatian Eagles, “A Brief History of the Croatian Eagles Soccer Club,” accessed August 24, 2015; and Bavarian Soccer Club, “History,” http://www.bavariansoccerclub.com/page/show/610216-history, accessed August 24, 2015. This information is now available at http://www.bavariansoccerclub.com/page/show/2387786-about-us. ^ “Bavarians Capture Another Crown,” Milwaukee Journal-Sentinel, July 16, 2001. See also Charles F. Gardner, “Bavarians Hope to Make It a Double”, Milwaukee Journal Sentinel, July 18, 2003. ^ Milwaukee Rampage FC, “History of the Rampage,” accessed August 24, 2015. ^ Charles F. Gardner, “End of Road for Rampage,” Milwaukee Journal Sentinel, January 24, 2003. ^ Charles F. Gardner, “Wave’s Outdoor Venture Grinds to a Halt,” Milwaukee Journal Sentinel, May 16, 2006. ^ “United We Roar: 2015 [UWM] Women’s Soccer Media Guide,” pp. 54-60, accessed September 3, 2015. ^ Marquette Soccer, “2015 Quick Facts,” accessed September 3, 2015. ^ Marquette Soccer, “2015 Women’s Soccer Quick Facts,” September 3, 2015. Smith, Melvin I. Evolvements of Early American Foot Ball: Through the 1890/91 Season. Bloomington, IN: AuthorHouse, 2008. Wangerin, David. Distant Corners: American Soccer’s History of Missed Opportunities and Lost Causes. Philadelphia: Temple University Press, 2011.